Location: At the junction of Fairoak Road and Whitchurch Road, the entrance set back from the corner behind a forecourt (originally with railings). A free public library endowed by Andrew Carnegie and built in 1906-7 by Speir & Bevan, architects of Wharton Street, Cardiff. The sculpture is by T.A. Jones of Cardiff, stained glass by Harvey & Ashby of Birmingham, while the contractor was W.T. Morgan of Cardiff. The unusual butterfly plan echoes contemporary Arts and Crafts designs by E.S. Prior and W. Lethaby and is one of the earliest examples of such a plan form in Wales. The library was designed with a central lending section and well-lit outer wings housing children's and adult 'reading halls', with separate ladies' reading room adjacent to the lending section. A symmetrical single-storey Arts and Crafts Gothic style library of coursed rock-faced stone, Bath stone dressings and slate roof. It comprises a low faceted entrance range set diagonally between higher pavilion-like outer wings aligned at right angles respectively to Whitchurch Road and Fairoak Road. The entrance range has a steeply pitched roof behind a coped parapet, with a single skylight and spire, while the outer wings have central ridge ventilators. The central entrance has double panelled doors flanked by buttresses and has a segmental-headed doorway with 3-light small-pane overlight incorporating coloured glass. A panel within the parapet above the doorway is engraved with a dedication and is flanked by shields engraved 'AD 1906'. The buttresses are topped by panels with relief foliage. The walls curve out to the wings either side of the doorway where they incorporate pairs of windows with linked hood mould and foliage drop between the windows. The inner of each pair of windows has Art Nouveau stained glass. The parapet has blind arrow loops above the windows. A central narrow octagonal tower has battered, slate-hung sides below openings with louvres and projecting eaves with pyramidal lead spire. The outer wings have ashlar clasping buttresses. Beneath the eaves cornice these buttresses are decorated with panelling and angle shafts enlivened by relief foliage, above blind arrow loops. The gable ends facing the forecourt have 4-light mullioned and transomed windows, with subsidiary transoms and mullions above the main transom, and incorporating arched lights below the transom. Above the windows the gables are ashlar beneath the apex and incorporate a single vent. The 5-bay Whitchurch Road elevation to the SW has an ashlar plinth, coped parapet and freestone banding. It has single-light windows to the centre and ends, with taller 2-light mullioned and transomed windows between, each with subsidiary mullions above the transoms. The rear gable end, facing Cathays Cemetery, has a 4-light window (above an attached public convenience built in 1934). The Fairoak Road elevation to the E is similar, but at the R end is a doorway with panelled door and overlight. Above it the window in the end bay has a higher sill with foliage apron over a blank panel. The rear gable end, facing Cathays Cemetery, has 2-light mullioned windows upper R and L and an end ashlar stack. Behind the entrance range and facing Cathays Cemetery is a 6-window single-storey rear wing with 2-storey projection incorporating offices on its L side set back from the main wing to Fairoak Road. This has segmental-headed sash windows and yellow brick stack, while the main rear wing to its R has 4-pane metal-framed windows. The entrance vestibule has a glazed brick dado and terrazzo floor. A glazed mullioned and transomed panel is opposite the entrance, flanked by Tuscan pilasters and double half-lit panelled doors. The lending area is incorporated within the entrance range and the rear wing. Within the entrance range it is lit by a domed lantern with coloured glass, while the rear wing is top-lit by 2 hipped-roof lanterns. The light-filled outer wings, originally 'reading halls', have 5-bay roofs composed of flat-pitched arched braces boarded at collar beam level, on corbelled wall posts. In the Fairoak Road wing the 5th bay is concealed behind a partition to the rear incorporating the administration area. Listed grade II* as an especially accomplished and well-preserved Arts and Crafts design, utilising a corner site in an original manner, and for the additional special interest of its pioneering butterfly plan. 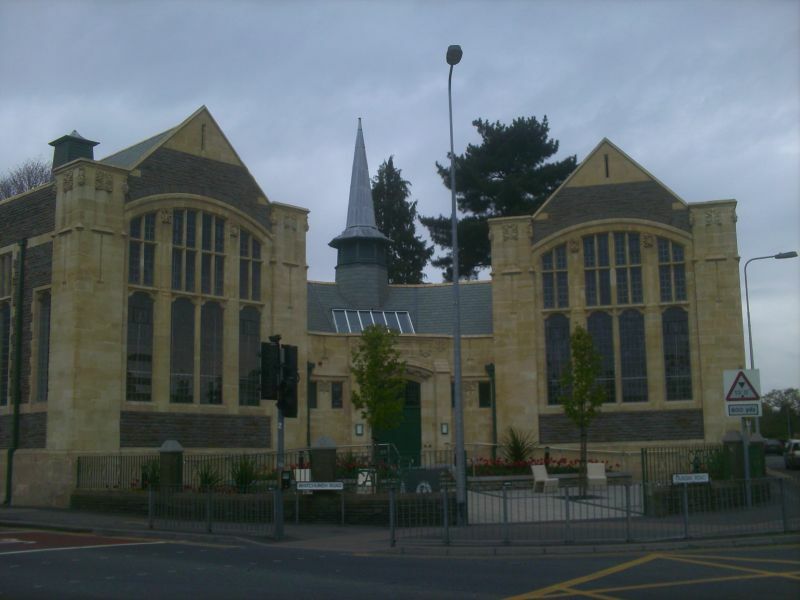 Group value with Gladstone schools provides historic integrity to the Cathays townscape. On the N side of the entrance drive to Maindy Barracks enclosed by railings. In its own grounds with parade square on the N side. On the E side of the parade square behind the former school. On the E side of the parade square. On the NE side of the parade square. On the W side of the parade square.